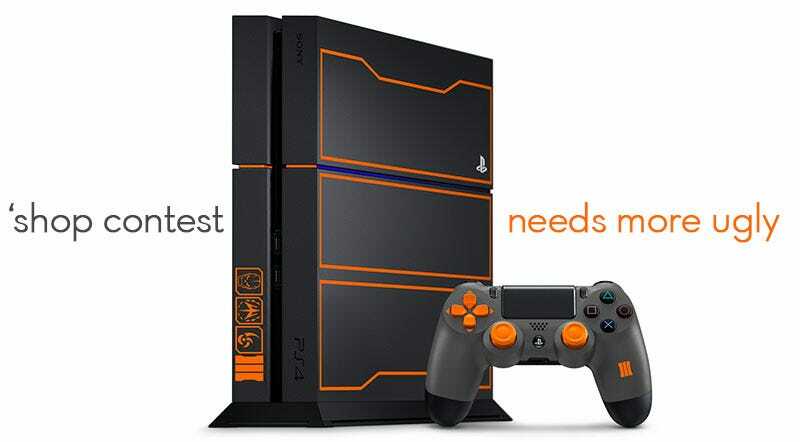 Earlier this week our own Evan Narcisse called the upcoming Call of Duty PlayStation 4 “Ugly As Sin.” He wants ugly? We’ll give him ugly. I’m not too put off by Activision and Sony’s Pumpkin Spice PlayStation 4. Black, grey and orange aren’t that bad of a combination, and considering how insane the pumpkin crowd is getting it might be a viable form of camouflage in the near future. Nah, that’s not ugly as sin. It’s not Evan’s fault. He lives in a magical world where everything is in the top percentile of attractiveness—himself, his family, his wardrobe—so ugly is all relative to him. So I say, with nothing but the utmost respect for the man, let’s give him never-ending nightmares. The rules are simple. Take one of the following conveniently large and transparent images and use it to create your own ugly PlayStation 4. All I want is the system and controller (or the camera in the black image) with transparent or white background, as if they were plucked from a store listing. Use whatever colors you want. Patterns. Images. Well, clean-ish images. Towards the end of next week I’ll ask Evan to help me pick the ugliest, should he still be capable of words. Contact the author of this post, the ugliest Fahey of them all, at fahey@kotaku.com or find him on Twitter @bunnyspatial.